Flowering Dogwood is considered by some the "queen" of North American forests because of graceful branching, beautiful and unique blossoms, red berries loved by wildlife and unforgettable red fall foliage. Unfortunately, the tree is being attacked by a disease called Dogwood anthracnose and is in some stress at higher elevations. Dogwood has a natural range throughout the eastern United States - from southern Maine down to north Florida and west to the Mississippi River. 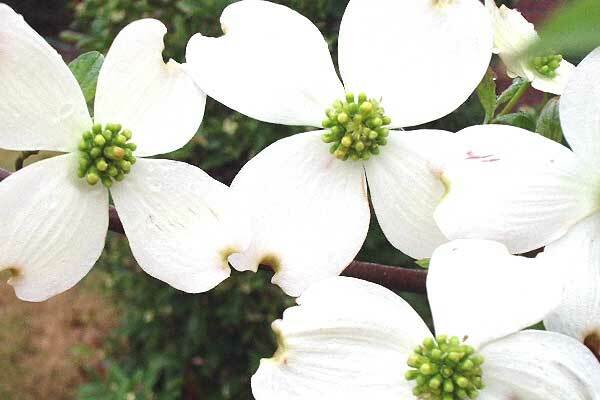 Habitat: Flowering dogwoods grow on moist well-drained sandy loams in open woodlands. Found throughout the eastern U.S. The inability to grow on extremely dry sites is attributed to its relatively shallow root system. It is one of the most numerous species in the understory of loblolly pine and loblolly pine-hardwood stands in the South. Description: It is named and admired for the white drifts of flowers (really petal-like bracts) present in early spring. Flowering dogwood grows well on flats and on lower or middle slopes, but not very well on upper slopes and ridges. Uses: Virtually all the dogwood harvested was used in the manufacture of shuttles for textile weaving. The red berries are excellent fall wildlife food.